Warner Bros and Hasbro are rolling the dice and taking a chance on a new Dungeons & Dragons film. Up until recently, Hollywood has had a pretty terrible habit of taking things that geeks love and transforming them into cinematic abominations so terrible they're hardly recognizable. Case in point, the 2000 film adaptation of Dungeons & Dragons. Filled to the brim with terrible effects and even worse acting, it was panned by filmgoers, critics and D&D fans alike. And as if that wasn't bad enough, it would be followed by a pair of sequels that, by many accounts, were even more wretched than the first. If you think that'd be enough to teach the film industry to leave Dungeons & Dragons alone, you'd be wrong. In a joint announcement earlier today Hasbro's Allspark Pictures, in cooperation with Warner Bros Pictures and Sweetpea Entertainment, confirmed that they intend to move forward with plans to make a new feature film based off of the beloved role-playing game. Speaking about the movie, Warner Bros' Greg Silverman expressed excitement over the possibilities a new D&D movie series cold offer. "This is far and away the most well-known brand in fantasy, which is the genre that drives the most passionate film followings," he said. "D&D has endless creative possibilities, giving our filmmakers immense opportunities to delight and thrill both fans and moviegoers new to the property." Dungeons & Dragons' owners at Hasbro expressed similar enthusiasm for the new movie. "This is such an enormous opportunity to bring the rich fantasy setting of the Forgotten Realms to life and, together with the creative powerhouse of Warner Bros use movies to tell the stories that have enchanted passionate D&D fans for decades," said Stephen Davis, Habsro's Executive Vide President and Chief Content Officer. 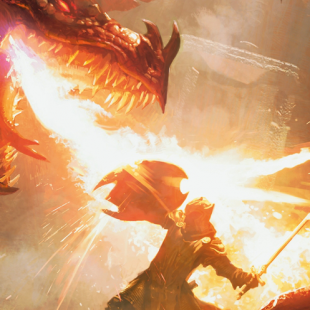 "D&D is the role-playing game that started it all and now we have the opportunity to ignite a franchise for its legions of avid fans in a way never done before." All of this comes, of course, following the resolution of a long running dispute between Dungeons & Dragon's owners at Hasbro and Sweetpea Entertainment over the franchise's film rights. Back in 2013, Warner Bros acquired Sweetpea hoping to take advantage of its possession of the film rights to produce a new D&D movie. Hasbro, alleging that Sweetpea had let those rights expire, moved to stop the film's production. Today's announcement signals the end of Hasbro's lawsuit following negotiations that we can only assume ended in a fashion that was agreeable to all of the involved parties. No release date has been announced for the new movie, but Warner Bros has confirmed that it has a finished script penned by screenwriter David Leslie Johnson and will also overseen by producer Roy Lee (How to Train Your Dragon along with executives from Hasbro. Here's hoping the end product doesn't make us want to gouge our eyes out.